Not since the era immediately before the Great Depression has the difference between the haves and the have-nots been as great as it is today: The 400 richest Americans own more wealth than 150 million low- and middle-income adults. But economists know that taxing the wealthy will help distribute income more equitably. That’s why ICAN is working with a network of partners and organizers across the country to show policymakers that the American people want the highest income earners and the wealthiest individuals to pay their fair share in taxes. Listen to Congress member and 2020 U.S. Presidential candidate, John Delaney and entrepreneur and 2020 U.S. Presidential candidate Andrew Yang, as they present their ideas about the ways to increase economic opportunity for all, prepare workers for the future, and help hardworking Americans get ahead. *These events are not in support of any one candidate, and are meant to highlight the important issues facing working families. We would like to be there with you tonight but we’re campaigning in Pennsylvania today. We’ll be back in Iowa very soon. Thank you for hosting this Tax Day event. You are raising some very important issues about how our tax dollars are being spent and how they are collected. At a time of massive wealth and income inequality, we need a progressive tax system in this country that is based on the ability to pay. It is unacceptable that major corporations have paid nothing in federal income taxes, and that corporate CEOs in this country often enjoy an effective tax rate that is lower than their staff. And we must have a government that invests in people and public services, not war, fossil fuels, and mass incarceration. Question 1: ​War and military action have led to gigantic military expenditures and huge obligations in future budgets to service debt and provide crucial care for our veterans. Do you support reducing U.S. military spending and increasing spending for urgent social and human needs? What spending cuts or tax increases do you propose to accomplish this change in priorities? Response: ​Yes. We will reduce military spending and increase spending for urgent social and human needs. That’s what this campaign is about. Today, the military-industrial-complex spends $700 billion a year on the military, more than the next ten nations combined. That is not right. We’re going to invest in affordable housing, we’re going to invest in public education, we’re going to invest in rebuilding our crumbling infrastructure. We’re not going to invest in never-ending wars. Implement a foreign policy which focuses on democracy, human rights, diplomacy and peace, and economic fairness. End U.S. support for the Saudi-led intervention in Yemen, which has created the world’s worst humanitarian catastrophe. American troops have been in Afghanistan for nearly 18 years, the longest war in American history. Our troops have been in Iraq since 2003, and in Syria since 2015, and many other places. It is long past time for Congress to reassert its Constitutional authority over the use of force, to responsibly end these interventions and bring ourtroops home. ● Audit and drastically cut out-of-control pentagon spending. Question 2:​ In light of recurring environmental disasters, like the floods currently being experienced in Iowa and Nebraska, how do we better use our tax dollars to prevent and mitigate the effects of the climate crisis? Response:​ Climate change is the single greatest threat facing our planet. Yet the giant, multi-national fossil fuel corporations have spent hundreds of millions of dollars furthering their greed and protecting their profits at the expense of our climate and our future. The recent report from the Intergovernmental Panel on Climate Change (IPCC) has made it clear that if we fail to substantially cut the amount of carbon in our atmosphere in under 11 years, the human, environmental, and economic costs will be severe and irreversible. Climate change is not a problem we will have to worry about 50 years from now. Iowa, you know this already. Just look at the recent flooding along the Missouri, Mississippi, and other rivers in the state this spring. Climate change is already negatively impacting real estate values due to sea level​ rise and global​ agriculture and food security​ through changing water availability, flooding, and drought. These trends will only continue as global temperatures and sea levels continue to rise. Pass a Green New Deal to save American families money and generate millions of jobs by transforming our energy system away from fossil fuels to 100% energy efficiency and sustainable energy. Invest in infrastructure and programs to protect the frontline communities most vulnerable to extreme climate impacts like wildfires, sea level rise, drought, floods, and extreme weather like hurricanes. Reduce carbon pollution emissions from our transportation system by building out high-speed passenger rail, electric vehicles, and public transit. Ban fracking and new fossil fuel infrastructure and keep oil, gas and coal in the ground by banning fossil fuel leases on public lands. End exports of coal, natural gas and crude oil. Question 3: ​In the United States, income and wealth inequality of greatly increased over the past 50 years, while money in politics has led to greatly diminished tax burden on the wealthy. Do you agree that this is a priority to be addressed in federal tax policy? What specific tax changes would you propose to address the problem? Response:​ Yes. 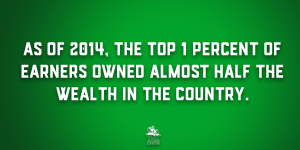 Income inequality must be addressed if we plan on tackling any of the issues facing everyday Americans. We can no longer accept 46 percent of all new income going to the top 1 percent, while millions of Americans are forced to work 2 or 3 jobs just to survive and over half of our people live paycheck to paycheck. We will no longer accept a situation in which, in the wealthiest country in the history of the world, our younger generation will have a lower standard of living than their parents. If we are serious about reforming the tax code and rebuilding the middle class, we have got to demand that the wealthiest Americans, large corporations and Wall Street pays their fair share in taxes. Pass the For the 99.8 Percent Act to establish a progressive estate tax on multi-millionaire and billionaire inheritances. Eliminate offshore tax scams through the Corporate Tax Dodging Prevention Act. Tax Wall Street speculators through the Inclusive Prosperity Act. Scrap the income cap on Social Security payroll taxes through the Social Security Expansion Act so that millionaires and billionaires pay more into the system. 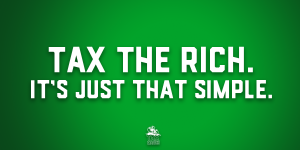 End special tax breaks on capital gains and dividends for the top 1 percent. Substantially increase the top marginal tax rate on income above $10 million. Close tax loopholes that benefit the wealthy and large corporations. In conclusion, we have an enormous amount of work in front of us. I believe that if we stand together, if we don’t allow Trump and his friends to divide us up; we will win. If we stand together as black and white, Latino, Asian American and Native American; we will win. If we stand together as gay and straight, native born and immigrant; we will win. If we stand together as rural and urban – north, south, east and west; we will win. If we stand together, this country has an extraordinary future. Let’s make it happen. Along with a coalition of progressive organizations, Iowa Citizen Action Network is partnering with Now This News, to put on a series of events with Presidential candidates*. Our goal is to make sure that family economic issues are front and center in Iowa and during the campaign. Each event will feature a Presidential candidate speaking with a small group of Iowans who have been laid off, downsized, or not received adequate paid family leave from their employer. We are trying to identify about 20 people who fit that description. Now This will broadcast the events online, and we will help amplify that broadcast as much as possible. 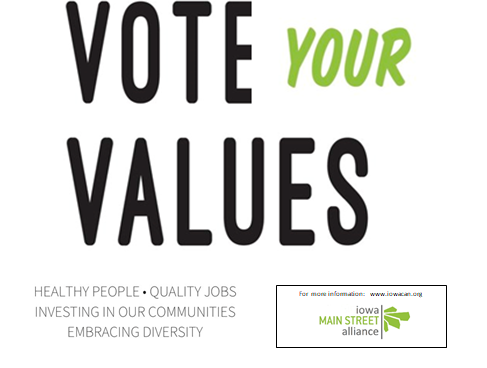 Shop Your Values is a campaign run by the Main Street Alliance to support small businesses that are active community members advocating for progressive values. 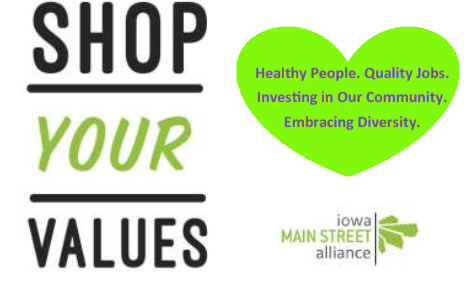 By shopping at a business that has signed onto the Shop Your Values campaign, you are directly supporting employers and community leaders who promote economic and social justice across the country. To sign up or for more information, go to: SHOP YOUR VALUES! Good businesses have a powerful role to play in helping build equitable, sustainable, and prosperous economies. But for too long, the conversation about “what is good for business” has been dominated by large corporations and trade associations that pursue race-to-the-bottom business practices to ensure their short-term profit goals. Our vision for the economy prioritizes investment in our businesses, our employees, our customers and our communities. Good business requires us to look beyond short-term profits and exploitative business practices and instead focus on making investments in our employees, our communities, and practices that create a sustainable environment and prosperous economies. 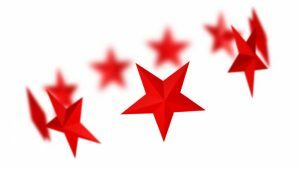 We recognize the mutual interests and values shared by business owners, workers, and customers: we are united not only through our economic transactions but also by our commitment to the communities that sustain our businesses and enrich our lives. A thriving economy depends on thriving communities. Strong businesses value our customers and strive to provide them quality goods and services. For us to prosper, our customers must also prosper. Independent small businesses and local economies are the backbones of a thriving community. Good government plays a critical role in nurturing business and community. It should equitably invest in, create, and enforce effective policies and systems to sustain independent business for the public good. Public investment is a critical component to create and sustain prosperous equitable economies and entrepreneurial spirit. Strong businesses view success as a shared enterprise. We recognize that treating all employees with dignity, a livable wage, and good working conditions lead to a better community for all. We take an active approach to building relationships with our customers and giving back to the communities where we live and work. Active civic participation of all in our community is essential to the growth and success of our businesses, communities and country as a whole. We push for policy participation and engagement of our local elected officials to provide a prosperous and sustainable small business community. Dubuque, Iowa — Main Street Alliance members in Iowa are celebrating the victory of Abby Finkenauer over longtime incumbent Rod Blum. They hope to find opportunities to work with Finkenauer on strengthening our health care system, expanding paid leave, and leveling the playing field so Iowa’s small business owners have the tools they need to create quality jobs. Ousted Representative Rod Blum elicited frustration from small business owners across the 1st Congressional District. His votes were focused on lining the pockets of his wealthy donors, not helping main street businesses and farmers. With real representation we look forward to Finkenauer providing real support for business owners: strengthening our health care system, helping small business create high-quality jobs, increasing diversity in small business ownership, and creating a level economic playing field so Main Street thrives and Wall Street contributes its fair share. The Main Street Alliance-Iowa (MSA-IA) has been working in partnership with Iowa Citizen Action Network since 2008 to make sure that the small business voice is heard from real small business owners, family farmers and the self-employed on policy that matters most. It is part of a national network of small business coalitions working to build a new voice for small businesses on important public policy issues. Alliance small business owners share a vision of public policies that work for business owners, our employees, and the communities we serve. Our advocacy promotes vibrant businesses and healthy communities, and fosters leadership development of socially responsible business leaders. Share Your Values. PRINT the Vote Your Values sign and display it! Let your employees and customers know where you stand on the issues. Tell your story, be authentic. Display election information at point of sale, on your outdoor marquis or in your window so that passersby are reminded to vote. Go to the: Iowa Secretary of State website for more information. 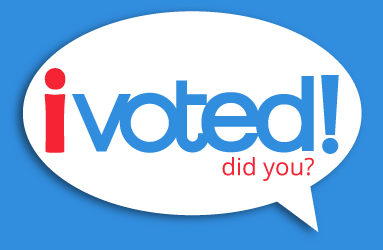 Encourage everyone to vote by putting a newsletter article on your website, in your e-news, and on social media, send emails to your staff, members, customers or clients, board, and volunteers encouraging them to vote. Join our team of small business spokespeople who are prepared to talk to the media about the issues, candidates, and the importance of civic engagement. One last thing! Have you filled out our survey? It only takes a few minutes and we’d love to hear from you! !